Visit a new park feature! Hike the Schoolhouse Park path with Owlexander, the Park District mascot, and his woodland friends. Busy tots will practice physical skills such as balancing on one foot like a bird, hopping like a bunny and stretching like a tree. They will also practice early learning skills like shape, color and letter recognition in nature. 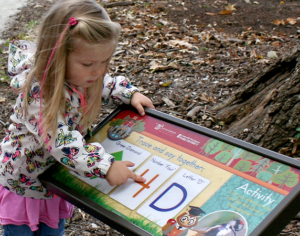 This series of six trail signs, located directly behind the shelter, is the right length to keep little learners happy! Owlexander’s Tyke Hike officially opened with a ribbon-cutting ceremony on October 13, 2016. It is the fourth trail in a creative collaboration between the Washington-Centerville Public Library and the Centerville-Washington Park District. The Nature Literature Trails are funded by the Yeck Family Foundation.